Matt Breida is an NFL running back that currently plays for the league’s San Francisco 49ers The franchise signed him as an undrafted free agent in 2017. Before then, he had played college football at Georgia Southern University with the Georgia Southern Eagles football team. Here is more about his bio, family, and accomplishments in the National Football League (NFL). Biography – Who Is Matt Breida? Matt was born in Brandon, Florida on the 28th of February 1995. He attended Nature Coast Technical High School, Brooksville, Florida where he played for the school’s football team – Sharks. After high school, he committed to Georgia Southern University where he played college football with the Georgia Southern Eagles football team. During his sophomore year in 2014, he made 1,485 yards, seventeen touchdowns (17) on hundred and seventy-one (171) carries. He also recorded 8 receptions for ninety-seven yards (97) and one touchdown. During his junior season, he rushed for 1,609 yards with seventeen touchdowns for 203 carries and then 3 receptions for 3 yards. As a senior, Matt recorded 646 yards rushes and 3 touchdowns on 168 carries, eleven (11) receptions for fifty-three (53) yards and two 2 touchdowns. Matt Breida was considered for several national athletic awards including the Doak Walker Award and the Maxwell Award. 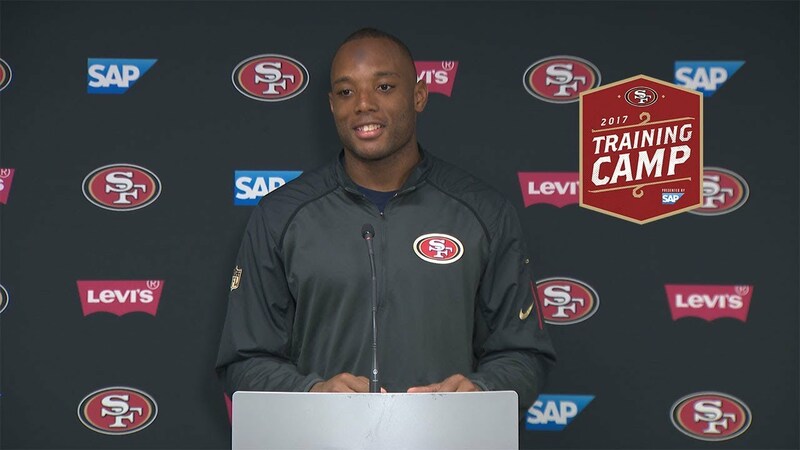 The San Francisco 49ers then signed Matt Breida as an undrafted free agent in May 2017. He began his first serving as Carlos Hyde‘s backup. His first NFL game was against Carolina Panthers and he recorded 4 rushes for eleven yards. Breida had an average of 6 carries during his first five games, rushing for 3.55 per attempt, He would later increase his workload to more than 10 runs during the final five games averaging 4.5 yards per run as the team ended the year on a five-game winning streak. Matt Breida then he ended his rookie season rushing for 465 yards with 2 rushing touchdowns, twenty-one receptions, one hundred and eighty receiving yards, and one receiving touchdown. He is usually called the black boy with white parents, but that matters less to the RB who is so grateful to Terri and Mike Breida, the only parents he knows and the only people who have stood with him and by him since he was an infant. The permanently disabled couple adopted Breida just a day after he was born and has nurtured him into the man that he is today and according to Matt they gave him everything that they could even though they didn’t have a lot. Adoption or no adoption, family is family, he sees them as his parents, and no matter what; they are his mom and dad despite the different skin colors. The couple got married at the age of twenty-five and tried consistently for ten years to have children of their own. After going through several tests and trying for many years, they gave up and decided to try out adoption. Mike and Terri went through all the process of adoption from attending necessary courses to getting the necessary certification and on March 2nd, 1995, they got a call from their adoption agency informing them about a two-day-old baby boy whose single mother already had two children, and could not afford to take care of another – the desperate couple didn’t hesitate to say yes. After Matt, the couple adopted another child – Josh, who is two years younger than Matt. Josh wishes to know who his mother is but Matt says the thought never crosses his mind, he is very happy, grateful and proud of having the Breidas as his parents. And to how the couple became permanently disabled. Mike had a life-threatening case of meningitis which he survived but it left him disabled for life. The disease also caused him a permanent brain damage, which has also affected his memory, as well as his ability to solve problems. In 2003, Mike had a terrible car accident that confined him to a wheelchair. In 2006, Terri had a more terrible accident which put her in a wheelchair as well and unable to walk and work. The Running Back is 5 feet 9.2 inches tall, that is 1.76 m) and weighs 91kg (200 lb). His other body measurements are not known.